Synopsis: The sole survivor of a global epidemic must wage an exhausting war against a sub-human vampire/zombie race. “Incredibly botched, totally unfrightening, ill-acted, sloppily written and photographed,” was Charlton Heston’s verdict on Sidney Salkow’s largely flavourless adaptation of Richard Matheson’s groundbreaking 1954 novel The Last Man on Earth. The granite-jawed one was no doubt a little harsh – he did, after all, have his own 1971 version, The Omega Man, to promote – but he had a point. Few films are remade as quickly as this one was – after all, there’s little point in remaking a popular movie until its prominence fades and a new generation of moviegoers are largely unfamiliar with it, and few filmmakers are going to take the risk of remaking a movie that failed to find favour with the public. Every now and then, though, someone will recognise the wasted potential of a badly made movie. Heston makes The Last Man on Earth sound like an abject disaster, which isn’t the case, but for a post-apocalyptic tale of a lone man besieged by vampire-zombies on a nightly basis, Salkow’s film is light on suspense or horror, and finds little time for melancholic reflection on the loss of the human race. The film takes place in 1968 – a short time in the future when the film was made, and three years after the human race was virtually wiped out by a devastating virus. Dr Robert Morgan (Vincent Price – Laura, Witchfinder General), apparently the lone survivor of the virus, used to mark the days since the death of his wife and daughter on a printed calendar, but now he crosses them off on crudely drawn pages on the wall of his fortress home. Life for Morgan, who, in humanity’s final days, was one of the scientists feverishly searching for a cure for the virus, comprises of a demoralising daily routine: by day, he searches for the reanimated bodies of the sleeping victims, and after killing them with a stake through the heart he dumps their bodies in a perpetually burning pit. At night he plays music to drown out the mournful calls (“Come out, Morgan! 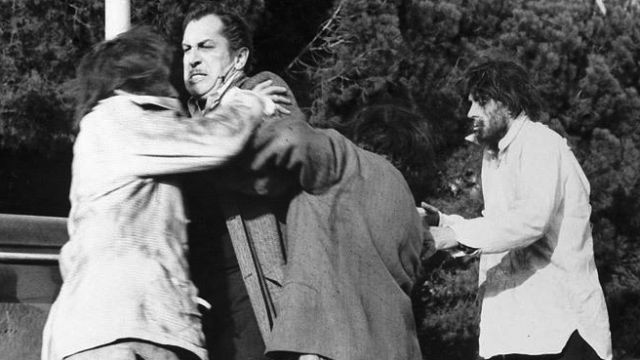 Morgan, come out!”) of the zombies – led by his former friend and fellow scientist, Ben Cortman (Giacomo Rossi-Stuart – War and Peace) – that gather at his house and ineffectually try to gain entry. Three years of this existence is slowly chipping away at Morgan, but hope is rekindled when he meets a woman called Ruth (Franca Bettoia) who also appears to be immune to the virus. But is she all that she seems? 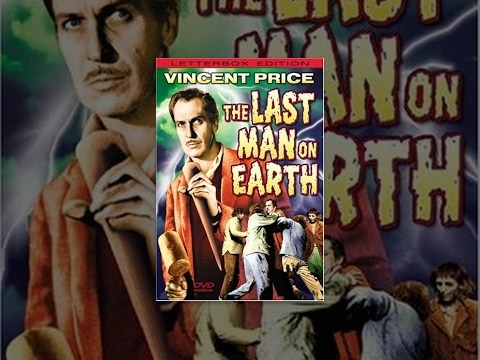 The original screenplay for The Last Man on Earth was written by Richard Matheson, the author of the novel on which it’s based, but it was rewritten so extensively by William F. Leicester (whose only film this was) that a disillusioned Matheson insisted he be credited under the pseudonym of Logan Swanson. For a film based on a novel, the world in which The Last Man on Earth takes place seems curiously ill-thought-out. The creatures with whom Morgan does battle are essentially indistinguishable from the zombies that would populate the sub-genre from Night of the Living Dead onwards (In fact, George Romero, the director of that seminal movie, cited this movie as a major influence on his film), and yet they possess many of the classic vampire weaknesses: they can only come out at night, making them vulnerable during the day, and can be warded off by garlic; and although their reflections are visible in a mirror, they are so repulsed by their own reflections that they are essentially rendered harmless. This hybrid version of the undead is a potentially powerful one, but they pose little real threat to Morgan because they are slow and clumsy and weak. All these nagging questions conspire to make watching The Last Man on Earth something of a frustrating experience, even though it sticks closer to the novel than either Heston’s The Omega Man or Will Smith’s 2007 I Am Legend. And, to its credit, the film retains both the deep irony reflected in the title of Matheson’s novel, and its allegorism. It was written in 1954, when America was in the grip of McCarthy’s Communist witch-hunt, but, given the Cold War era in which the movie was made, it’s possible to discern a compelling subtext built upon deep-seated fears of the potentially catastrophic consequences of the political conflicts of the time. Although Vincent Price is miscast in the role of Morgan, he succeeds in conveying his character’s bone-deep despair and frustration. He might be nobody’s idea of an action hero, but there’s nothing to say that a slightly prissy scientist can’t be the sole survivor of a global epidemic – and wouldn’t a man who’s at home amongst beakers and test tubes look vaguely comical engaging in hand-to-hand combat with a group of weak zombies?